Eureka Entertainment have announced that they will be releasing Van Gogh, considered by some to be the greatest film by legendary French filmmaker Maurice Pialat, seven of whose previous films have been given Masters of Cinema editions (including L'Enfance-nue and A nos amours). 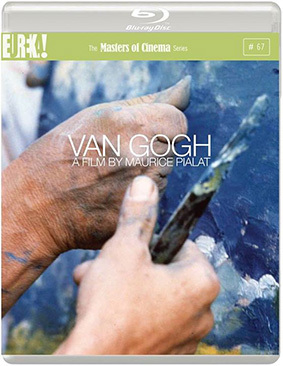 With its loosely factual and wholly inspired treatment of the last period of Van Gogh's life, Pialat's film applies an impressionist touch to the biographical picture — indeed, the filmmaker was himself an accomplished painter, and the personal resonance of the subject matter results in an epic, major late work. "An extraordinary film....We flatter ourselves that if we were around in 1890, we would have recognized Van Gogh's genius and changed his fate. But we probably wouldn't have – just as we probably don't recognize the Van Goghs among us now. In this sad, brilliant film, Pialat gives us a terrible inkling of why." – Michael Wilmington, Los Angeles Times. Van Gogh will be released for the first time on Blu-ray and on 2-disc DVD on 23rd September 2013 by Eureka as part of the Masters of Cinema series at the RRP of £19.99 for each. 56-page booklet containing a new and exclusive essay by critic Sabrina Marques; Jean-Luc Godard's letter to Pialat after seeing the film, followed by Godard's tribute to Pialat upon the director's passing in 2003; copious newly translated interviews with Maurice Pialat; images of Pialat's canvasses; rare imagery; and more.